Today's bigger tires, bigger engines and more sophisticated suspensions put extra demands on today’s gearboxes. 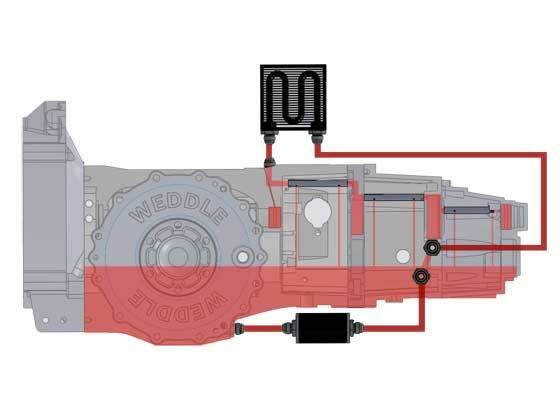 The new Weddle HV2 transaxles take oil distribution and lubrication to the next level with an internal lubrication system option. While the original HV1 oil system relied on internal splash to lubricate the main shaft bearings, the newly developed HV2 lubrication system directly feeds a constant supply of oil to all main shaft bearings and gears. Efficient Internal Oil Pump. New for next generation Weddle HV2s is a compact, efficient internal oil pump that is powered by the pinion shaft. This eliminates the need for an external pump and power source. Since the pump is run off the pinion shaft, as the wheels spin faster, the pump increases action as well. Options, gear ratios and technical information here. Call 805 562 8600 or email us for your nearest dealer. *Suggested price for complete, assembled trans.